Sometimes people get really mad when I talk about orthorexia. Like shouting match loud and mad. “How can healthy eating be a problem? Next you’re going to say that it’s fine to eat fast food…” And the truth is- it’s fine to eat fast food. I’m not saying you should eat it every day or multiple times per day, but it’s fine to have it and it’s unrealistic to think you never will. (Hello road trips and unexpected life events.) The emphasis on healthy eating, food rules and rigidity around the healthiness of food- such as how it was made, ingredients, packaging, where it comes from are rooted in diet culture. When this information is used appropriately it can support health, but more often than not, I’m seeing it taken to the extreme where it interferes with health and quality of life. Enter orthorexia nervosa. 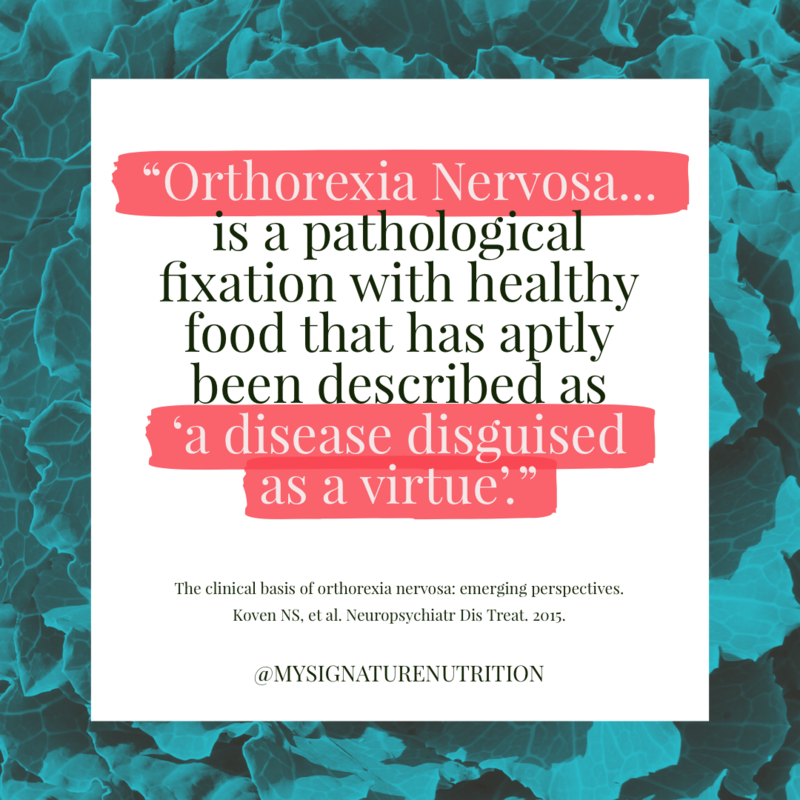 Orthorexia nervosa is a pathological fixation with healthy eating. How could that be a problem? 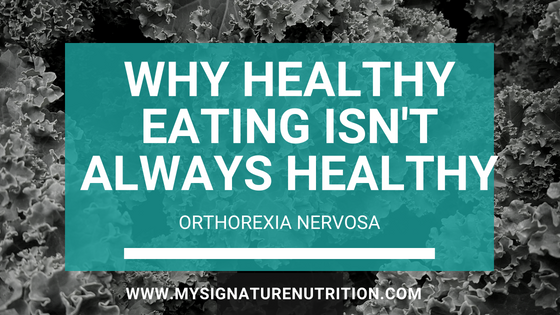 Because with orthorexia, eventually healthy eating turns into pathological eating where it interferes with your quality of life and negatively impacts health and wellbeing. This is where people get mad and struggle with the idea of orthorexia. I’m not saying healthy eating is bad or that the pursuit of healthy eating is bad. (I am a dietitian. I do want people to be healthy- if they want to be healthy.) I’m saying that healthy eating and the pursuit of healthy eating can lead to the point where it detracts from health, is harmful and destructive! Honestly, it can even lead to death. When I talk about orthorexia I’m not talking about being healthy- I’m talking about where the pursuit of health interferes with health. In truth orthorexia is better described as a disease disguised as a virtue. What appears as healthy eating isn’t necessarily healthy. Especially when it comes to rules from diet culture and wellness culture. These rules mimic disordered eating and increase stress, anxiety, guilt and shame around eating. As I’m working with clients I’m seeing more and more rigidity about the healthiness of food. It starts innocently- with a desire to be healthier, to live a longer life, to prevent disease. But then, the food rules grow from there. We know that restriction increases food focus, anxiety, guilt and shame. And what develops over time is a pattern where emotions are managed through food exclusion- that you’re okay because you didn’t have grains, sugar, gluten or another forbidden food. When you eat in this manner you feel good, righteous, proud and safe BUT when you have something forbidden, even if on accident, you feel anxious, guilty and upset. Food becomes something that is feared and a danger you must control. Because there is such a great desire to control your food intake you end up fixating on food more. You relentlessly meal plan, read recipes, look at food online, read ingredients, look at online menus and eventually you stop going out to eat, stop eating at your friends houses, stop eating food prepared for you, skip social engagements, and end up isolating yourself away from friends and family because you can’t eat what they’re eating. For some people it goes a step further where their rigidity around food doesn’t just apply to them, but to other people or even being in the proximity of foods perceived as “bad “or “unhealthy”. I’ve had clients cry in my office about their family’s eating pattern about how they’re so worried about their family because they eat “unhealthy.” What they’re not realizing is that their focus on food has destroyed their relationship with their family. Their family wants to enjoy a variety of food and celebrate while not being constantly nagged and criticized by the food police. Plus criticizing and judging (essentially shaming) other people’s eating does not promote behavior change- it has the opposite effect. Maybe you’ve even experienced this yourself. One of the biggest difficulties with orthorexia is that on the surface it can appear healthy. I call it “instagrammable” where the foods consumed are the ones you would see on social media related to health and wellness. And this is what makes it hard. Diet culture normalizes this disordered eating pattern. It reinforces food rules. It adds more food rules. It celebrates following food rules. The problem is over time food rules change (it’s impossible to stay up with all of them) and then this triggers more restriction, anxiety and fear. While on the surface it may appear innocent or even “healthy” the truth is that it can completely interfere with and derail your life. What starts as a small list of restricted foods grows to the point where you cannot meet your nutrition needs (nutrition and health begin to suffer) and it interferes with your ability to be social, have relationships, go out to eat, eat at life events and parties. It ends up causing more focus on food, anxiety, fear and shame. When struggling with orthorexia, it seems that you could just eat a food if you wanted to, that you’re simply choosing not to engage. But eventually, it gets to the point where you cannot eat the unhealthy food. The idea of eating the unhealthy food triggers extreme anxiety and food fear. Where once food exclusion was by choice, now it’s no longer a choice, but per the eating disorder it feels like a choice. And that’s what makes it so confusing. The belief is that you could eat a food if you wanted to, but in reality you’re not able to. This is what I see with my clients– it’s not a choice! In reality, the much harder thing to do is to eat the feared “unhealthy” food than it is to continue restricting it and missing out on life events. Sadly diet culture (and wellness culture) reinforce this eating pattern. 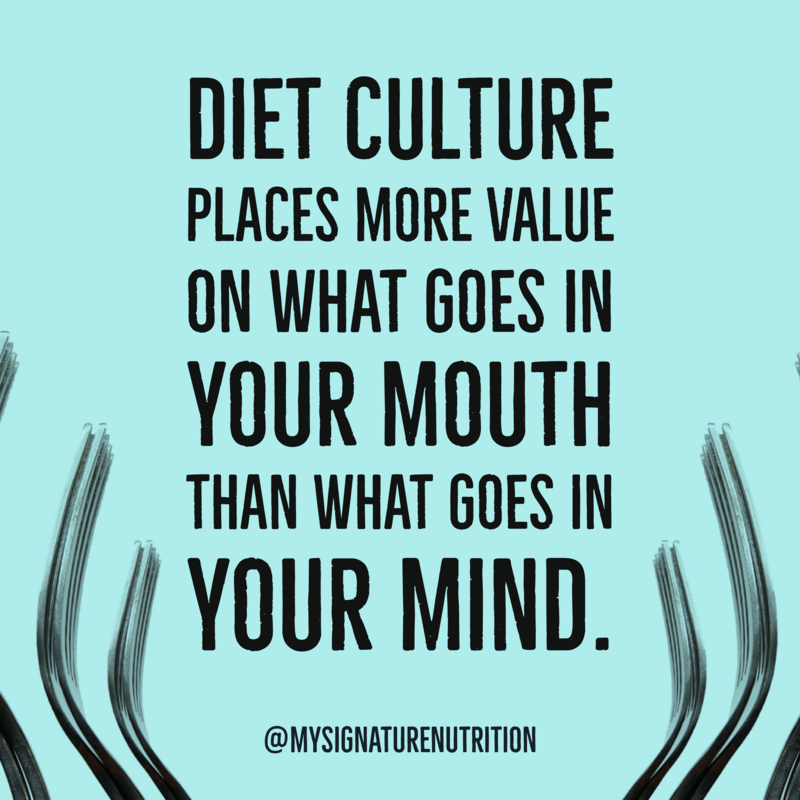 Diet culture (and wellness culture) care more about what goes in your mouth than what goes in your mind. When you’re struggling with your eating the biggest risk factor isn’t what you eat- the biggest risk factor are the thoughts and beliefs you hold about food- in essence what goes in your mind. The thoughts you hold about food impact you both physiologically and psychologically. 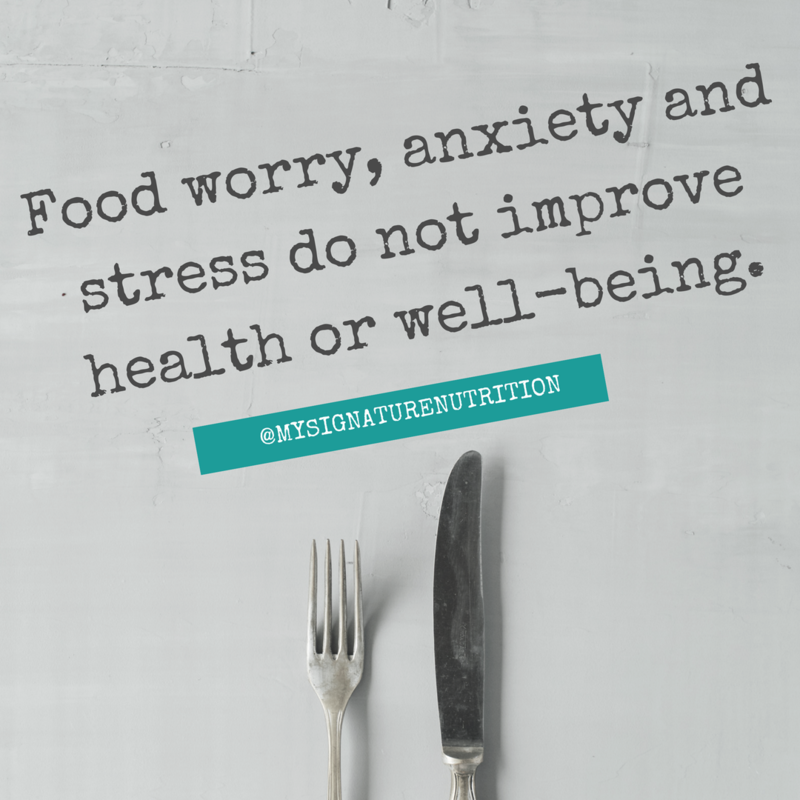 Food worry, anxiety and stress do not improve health. They make you feel bad and can even harm your health. I would argue that if you feel that you need to be more careful with your eating then be careful about what messages you let in and what you allow your mind to consume. If you’re concerned about a loved one- seek help from a dietitian that specializes in the treatment of eating disorders. It’s not uncommon for someone to have concerns, seek help but then have the very behaviors and thoughts reinforced (or even made worse) by a clinician rooted in diet culture. I see this all too often. To the person suffering, it’s extremely damaging, confusing, and just reinforces eating disorder thoughts/behaviors. Here’s a place to find a safe provider. (1) I spend so much of my life thinking about, choosing and preparing healthy food that it interferes with other dimensions of my life, such as love, creativity, family, friendship, work and school. (2) When I eat any food I regard to be unhealthy, I feel anxious, guilty, impure, unclean and/or defiled; even to be near such foods disturbs me, and I feel judgmental of others who eat such foods. (3) My personal sense of peace, happiness, joy, safety and self-esteem is excessively dependent on the purity and rightness of what I eat. (5) Over time, I have steadily eliminated more foods and expanded my list of food rules in an attempt to maintain or enhance health benefits; sometimes, I may take an existing food theory and add to it with beliefs of my own. (6) Following my theory of healthy eating has caused me to lose more weight than most people would say is good for me, or has caused other signs of malnutrition such as hair loss, loss of menstruation or skin problems. *This self test is developed by Steven Bratman, MD, MPH author of Health Food Junkies. If you’d like more information on orthorexia I recommend checking out his book and his website. In summary healthy eating isn’t always healthy. Food has the power to improve health, happiness and the quality of life but it can also become destructive, dangerous and all consuming.